This past Monday night I sat in a lounge/restaurant with two of the most hilarious phenomenal people I know and laughed. I laughed harder than I’ve laughed in what feels like a really long time. 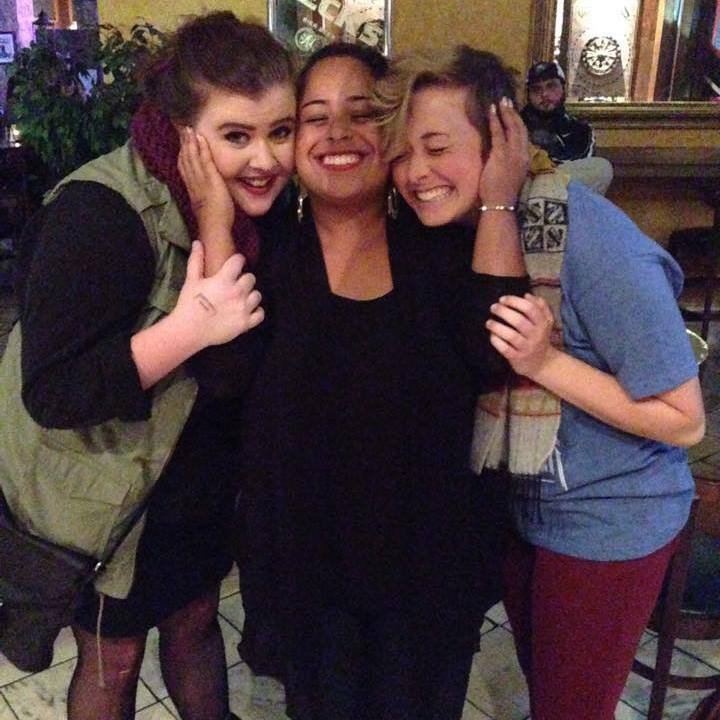 Something about the laughter, the great food, and the drinks, the fact that it was a Monday night and that these two awesome women were by my side made the craziness I’ve been feeling surrounding me lately, simply go away. It was like our presence plus the laughter and great queso dip made the crazy stress say “alright I’ll go away”. I think that I’m guilty of half the stress I am experiencing. And let me tell you why. It’s not because I do too much (kinda) or that I don’t know how to balance my time. It’s because I’ve been allowing myself to sink so deep, so so so deep into every negative emotion that I’ve hardly been able to enjoy the truly beautiful moments. I’ve been stressed from the moment I stepped back into class in August, but I assume that because I’m over-involved, am a senior, and projected to be on her way to greatness that I cannot show weakness for one single second, and that my friends, is so very stressful. I’ve been sad, I’ve had my heart broken this semester, and you’d think it gets easier but it really really doesn’t. I’ve been angry, finally after so long of letting things slide I realized that I can be angry and how to be angry but now it’s so simple to be angry and I’m passionate about way more than I thought I was and I get angry (because I care) about way more than I thought I would. I’ve been self-conscious. Gaining weight instead of losing weight when you’re trying to lose weight is such a downer, and I’m not getting into the whole confidence self-image talk right now but it is stressful and anxiety-inducing to have your body changing into a shape that you’re finally strong enough to love but you’re just not there yet. And all of this I say not to solicit pity or sympathy or attention…but to be honest and express the fact that this, ALL of the above, has contributed to a chronic funk that has BARELY allowed me to truly enjoy my last fall semester of my undergraduate career. 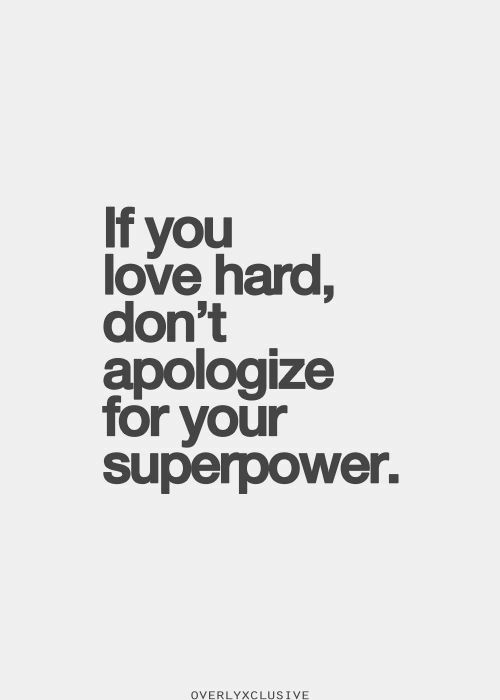 So when I cam across this quote, by who I’m not sure (thanks Pinterest) It made me stop, and realize this all over again. 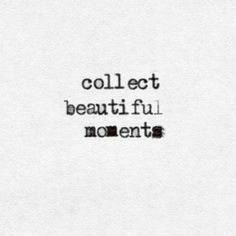 You have to STOP and collect the beautiful moments. I’ve had a few beautiful moments this semester. One an award that led me to meet other people working to change the world and make a difference. Grown closer to people because our time together consistently is winding down. So, I say all of this to say, that life is full of beautiful moments we don’t stop to collect often enough. We lie and wallow and swim in the depths of negativity before we choose to do the same in positivity. And why? Because it’s easier? That makes no sense. Negativity just makes things harder. I suppose we’re wired that way though, the more stress the more we wallow. I’m not saying to not be stressed, that’s impossible, especially in this day and age, I’m saying take a moment, at least once each week and collect the beautiful moments you didn’t bother to collect as they were happening. That laughter, that margarita, and queso dip made me feel freer than I’ve felt in a while. But that was just one moment. One of many that have happened, and many that will happen. So just don’t forget to pause. You never know how free you can truly feel until you do. I remember being little once and trying to frown in a photograph. My mom immediately stopped and said no, the room gets brighter when you smile. The innate hopeful-world changer in me from that point on decided that until I could make a difference in another way, I would make places brighter, by smiling. Smiling however, is painfully difficult the older you get. You see, smiling can be a reaction, or it can be a decision. But the heavier life gets, the harder it is to get that reaction or make a decision. I can probably pinpoint the time I felt that smiling began to be a heavier task than usual. You see I was so used to smiling in real life AND in dance, the performance mindset had integrated with my own. I’ve hidden behind my smile my whole life, assuming if I just kept it up I’d be okay. But sometimes it’s a lot to handle, sometimes it feels like you’re carrying on and on and on and on smiling, with no time to breathe, as if you’re under constance surveillance, and the world is your audience. Why does life have to feel like such a performance all the time? Why do we have to be so perfect all the time? It’s exhausting. And frankly, I don’t know about you, but I’m exhausted. I, like everyone else need a break. I need my intermission. It’s a time to re-group, re-focus, re-touch your make up and/or hair, and to more importantly, catch your breath. I feel as if life and society circles around us like one endless show after another and people expect performances day in and day out, but rarely take the time to truly encourage the intermission part. My moments of intermission come at night, when I’m finally in my room after a long day. I sit down in my desk chair and I exhale, for what feels like the very first time all day. Sometimes there are tears, sometimes there’s just exhaustion, sometimes there’s satisfaction. But the next day, even if I start off tired, somehow I always end up smiling. And it’s there when the choice is made, that I try to shift my thinking of smiling even when I don’t want to, not as a mask, but as a shield. My smile is my shield. I don’t pretend to be perfect. If I do, please stop me, I’m lying and I hate lying. And if you do it, you’re lying too. But a lot can hide behind a smile. My smile protects me. It is a part of my identity. It is a part of what makes me, me. It is my shield. It blocks me from allowing what I might be feeling to affect my entire body. The smile can be the glue. The smile can be the pieces of velcro that make feelings inside me that are pretty packed in there-fit just right and stay still until my next intermission. My smile , is one thing I try to not let waver. Sometimes it’s not the right time to not pretend, but we all have days in which there is one thing, just one thing, acting as the glue that holds us together. My smile and I have an awesome relationship. From the days where it was just gums, to the two tiny teeth my mom cleaned with a Q-tip and baking soda, to now… it’s been a long time coming, a lot has happened, and I don’t often give it enough credit. You see behind my smile lies my to-do list. Behind my smile lies my dreams, aspirations, goals, memories, nightmares, fears, beliefs, and my spirit. Behind my smile is me. When the smile is off, there’s more of me there. But it’s my gateway. BUT, smiling is a choice you see. It’s like deciding to do one more rep even though you’re already shaking and sweating and dying from the three you already did. When you smile through things, it builds your strength, it builds up the strength of your smile and ultimately your attitude. I’ve found that there are a lot of things that challenge the sanity and genuine-ness (that’s a word) of my smile. There are people who challenge it, instances that challenge it, classes, moments, pictures, stories, lies, truths, and pieces of life that test my smile. Ultimately it’s a blessing that we have a choice. Every day is a new opportunity.You can sulk, you can mope, you can wallow. You have a right to do so. You have a right to take a break. Don’t forget to take that intermission. And yet the show must go on. So don’t ever underestimate the power of a smile.